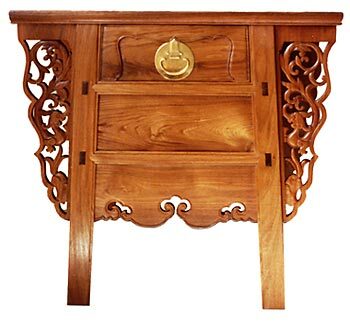 3rd prize - Traditional Furniture, 6th National Woodwork Competition 1994. Compact and beautifully proportioned, this single drawer coffer is decorated with open-work carved spandrels. The lock mechanism is faithfully reproduced. The hidden compartment can only be reached after the drawer is removed.